Mark your calendars! Plans are coming together for our next Triennial International Convention. Join us in Kansas City on November 2-4, 2017! Our hotel, the Marriott Kansas City – Country Club Plaza puts you in the heart of Kansas City’s world famous Country Club Plaza, the Midwest's premier shopping, dining, and entertainment district. Situated between two distinguished art museums, The Nelson Art Gallery and the Kemper Museum of Contemporary Art, the Marriott is an ideal location to get together to celebrate Pi Gamma Mu’s rich history. Waleska, GA – Reinhart University - October 16, 2015 REGISTER TODAY! The Georgia Rho chapter of Pi Gamma Mu International Honor Society in Social Sciences invites you to participate in the chapter’s first annual Interdisciplinary Undergraduate Research Conference. The theme of this year’s conference is "Bridging the Gaps: Building interdisciplinary connections within social science". It will be held from 9 a.m. to 1 p.m. on October 16, 2015 on the Reinhardt University campus in Waleska, GA.
Pi Gamma Mu celebrates its chapters through a unique display at the international office located in Winfield, Kans. 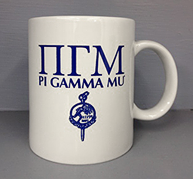 Over the years, Pi Gamma Mu chapters have generously provided gifts of collegiate coffee mugs to the international office. 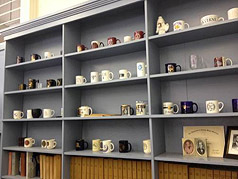 A total of 46 coffee mugs in addition to other items such as a hand carved wooden spoon from the Philippines, collegiate lapel pins, paper weights, and more have been given to the society over its 91 year history. 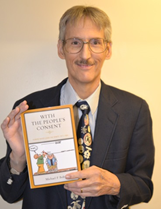 Dr. Michael P. Bobic, former ΠΓΜ chapter sponsor, explores Howard Baker’s ability to lead the United States Senate at a time when it was divided by partisanship and ideology in his new book With the People’s Consent: Howard Baker Leads the Senate 1977-1984. The book features a quantitative analysis of Senate leadership through roll call analysis, an evaluation of the advantages and difficulties in roll call data, and a discussion of data used to evaluate Baker’s leadership in the 95th to 98th Congress. Part of the mission of Pi Gamma Mu is to foster cooperation and social service among its members. With this in mind, we urge you to join us with helping those in need. Pi Gamma Mu International Honor Society is encouraging its chapters to start a donation box for a shelter during these last few months of 2015. 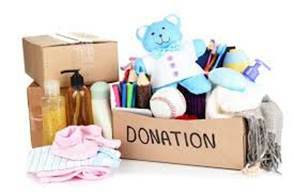 Items needed most include: new pillows, diapers, toilet paper, paper towels, cleaning supplies, blankets and comforters, gift cards, personal care products, baby supplies, and laundry detergent. Please contact a shelter in your area to find out what they need most. We are hoping to make this national service project a success by collectively helping people in need throughout our respective communities. Beth Biddle, Associate Director for Chapter Services, celebrates 20 years with Pi Gamma Mu this month. Biddle started as a part-time office assistant in 1995 and took on additional responsibilities and hours over the years. She is now a full-time staffer at the society managing a variety of services for members and chapter sponsors. She faithfully fulfills all requests for membership credentials and insignia that come into the international office. Phillip Warlick, Pi Gamma Mu lifetime member and former Vice President of the Maryland Theta chapter, designed a new banner for the chapter housed at the University of Maryland University College. The sponsor of the chapter is Dr. Katherine Im, Program Chair, Gerontology and Social Sciences. The banner is pictured here. It features Pi Gamma Mu’s colors, blue and white, which represent truth and light. It also includes a wreath suggesting that social science is the outgrowth and fulfillment of natural science. FormSwift.com, a young startup dedicated to creating personal and legal templates that are customizable, easy to use, and highly professional, is holding a $1000 Summer Business Plan Contest. The contest is available to high school seniors, undergrads, and graduate students across the country. The company chose a business plan contest in order to provide students with a way to both pay for tuition and prove that they are startup savvy. The application deadline July 30, 2015. The Kansas Lambda Chapter at Wichita State University (Kans.) welcomed 32 new members at an initiation ceremony on March 27, 2015. The ceremony was attended by new initiates and their families as well as guests from the university and the Pi Gamma Mu Board of Trustees. Enjoy these snapshots from a few of the 2015 Pi Gamma Mu initiation ceremonies. 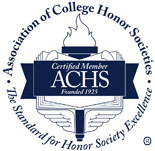 Email your chapter’s photos to [email protected] for inclusion in a future issue of the newsletter. The International Board of Trustees wishes to express their thanks to the chapter sponsors that help keep Pi Gamma Mu going. Pi Gamma Mu chapter sponsors donate their time and talents to provide the recognition social science honor students deserve. Pi Gamma Mu values the time, energy, and resources its chapter sponsors commit to their students every day. Serving as a chapter sponsor can be an incredibly rewarding job and our staff is dedicated to keeping sponsors informed of resources that can contribute to their success. A significant goal of Pi Gamma Mu is to bring the ideals of scholarship, collaboration, and service to colleges and universities around the world through reactivating and establishing new chapters of Pi Gamma Mu at these institutions. In order to achieve this mission, society staff continually reaches out to college faculty to solicit interest in providing recognition to top social science students through establishing a chapter of Pi Gamma Mu.